Often thought of as embarrassing condition, impetigo is an extremely common complaint especially amongst young children commonly of pre-school age. It is highly contagious, so can be contracted very easily and is also often seen in those who play close contact sports or work in close proximity with other people which really should remove the stigma of it being an embarrassing problem. The reason it is thought of as embarrassing is because it is often contracted as a result of poor hygiene practices and is spread through contaminated touch from areas such as the hands. As children are unlikely to adhere to strict hygiene practices or are unable to manage their hygiene efficiently or adequately they are the group of people who are the most affected.The actual cause of the problem is due to certain bacteria that infect the skin and cause sores. There are two types of bacteria that can cause impetigo each causing different symptoms and nature of sores but always on the skin. In many cases of impetigo your doctor may simply recommend stricter hygiene practices and frequent cleansing of the skin and allowing the area to air dry thus preventing the infection spreading via towels and also to prevent excessive drying and irritation to the skin itself.The most common interventional treatment for impetigo is to apply a topical antibiotic ointment to the affected area. The ointment is most suitable as it is ideal for children who may be reluctant or unable to swallow tablets or dislike medicines and can be applied gently without causing discomfort. Administering antibiotic therapy in this manner also reduces the likelihood of some of the common side effects of these drugs such as diarrhoea or gastric irritation.It is important to continue using the ointment even after the scabs that might have formed begin to dry and clear up as the active agent in the lotion will need to get into the sore and kill the bacteria held within. If blisters have developed do not try and pop these yourself as this increases the chance of further infections and soreness; they must be allowed to dry and shed in their own time all the while continuing to use the ointment.If an adult has developed impetigo and the case is quite severe it may be treated with oral antibiotics if necessary. As impetigo is a highly contagious condition it may not be possible to always prevent contracting the bacterial infection though certain practices will help to prevent you from spreading it yourself. Hygiene should be paramount and frequent washing of the skin especially the hands, before and after toileting and eating, will be needed.Nails should be kept short and clean, using a nail brush when needed and should not be bitten. Children who have impetigo or those who work in an environment with other people especially those who are vulnerable should not mix with others or socialise during this time and are advised to refrain from this until the treatment has had a chance to kill off the infection and become less contagious. With children who are using the ointment, this is normally one week after treatment has begun.As a carer it is important to remember to wash your hands before and after applying the ointment or after being in close contact with your child and remember to keep your hands away from food, your nose and mouth or any open sores you might have. 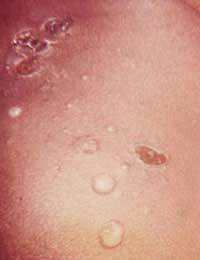 Impetigo is a highly contagious condition and is more common in children. It is often thought of as an embarrassing problem which may be a little unjustified because of its high level of contagion. What Causes Worms and How are they Treated? I’m 13 years old and I always get impetigo since I was 10 . My dad forced me to go to school with a huge wart on my nose . It was awful everyone used to say errr what’s that in your nose . But then I’ve been starting to use the fucidin acid which really helps . I’m at a very important holiday to London with my auntie and hers sister and her husband my impetigo has come . I’m hiding upstairs pretending to brush my teeth. It’s extremly embarrassing I don’t wanna go down ?????? I'm 19 years old. I work in retail and have plenty of family who are little children. The other day at work I realized that, what I thought were just, a cluster of mosquito bites were becoming quite inflamed. I fell asleep that night with longer socks on an a antibacterial cream, but woke up to my cluster of mosquito bites, that had not been broken before, were oozing yellow pass and were much more inflamed. I was very nervous so I called my doctor and made an appoint. I thought they were going to tell me I just had a very bad case of poison ivy and would put me on steroids but the doctor came in and told me that she thinks I had impetigo. I was terrified at first because I had no idea what it was and it sounded dangerous. But she continued to tell me that there was no reason to be alarmed because it was quite common. She gave me a oral prescription and a topical ointment to put on and take twice a day. I'm only on my first day of treatment but the yellow puss is going away however the inflammation is still very much there and it's not painful but extremely itchy. Before I apply the ointment I would dab the open wounds with hydrogen peroxide to make sure it was clean and try. I wrap it up with gauze only because I don't want my family and friends to be grossed out because it's not very attractive. But so far so good. I haven't passed it on to anyone. And I'll keep this website updated with the progress !